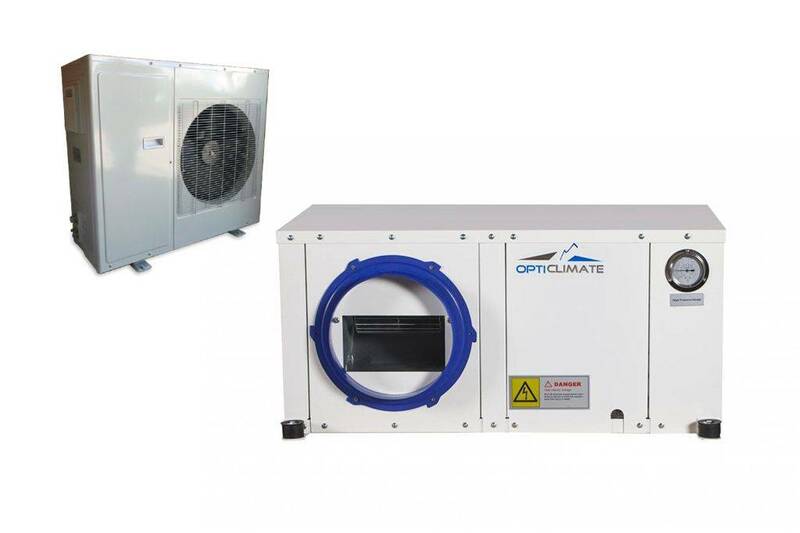 The OptiClimate 10000 PRO4 Split EX from the new PRO 4 series is a lot more efficient with electricity and has a much higher dehumidifying capacity. This new OptiClimate 10000 PRO4 Split EX has a cooling capacity of 10kW and has 3x1500W heating elements. The OptiClimate PRO 4 Split units are also available in an EX (Extended Reach) model. The EX model can bridge distances up to 30 metres between the indoor and outdoor unit. Comes with a quick-connect 15-metre cooling hose which consists of a set of two hoses. If a longer cooling hose is needed, this can be ordered upto a maximum distance of 30 meters. For example, if 30 meter cooling hose is needed for a OptiClimate 10000 PRO4 Split EX you should order this cooling hose 15 times (for 15 meters extra). During cooling the air is dehumidified. This is a natural phenomenon. The unit cools and dehumidifies the air. If the unit stops cooling, for example by overcapacity (the set temperature is reached) dehumidification will stop. The humidity will therefore rise for the period the unit doesn’t need to cool. 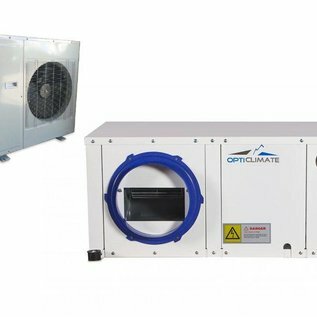 The OptiClimate PRO4 can also dehumidify when the set temperature is reached. This feature can be activated by setting menu D:32 on 1 (default is 0). When the desired temperature is reached, the unit will nevertheless continue to cool, but the heat that is normally emitted to the water will now be transferred to the air which comes out of the unit (the heat is recycled). As a result, there won’t be any water consumed at that time. The dehumidification is not regulated by the hygrostat but via setting menu D:32 on or off. The unit shall dehumidify at its max without taking account of the hygrostat. In the case of the PRO4 it therefor doesn’t matter if the unit has overcapacity because it will continue to dehumidify in day mode even when the set temperature is reached. The unit will cool to dehumidify if the set value at the hygrostat is reached. The cooling is partly offset by the electric heating elements in the unit. During dehumidification water is consumed + electric power for the heaters is used. At night the OptiClimate PRO4 will also cool to dehumidify if the set value at the hygrostat is reached. However, the heat is not released into the water but is being transferred to the air that comes out of the unit. Therefor during dehumidification no water is consumed. The electric heating elements won’t be activated because the heat is recycled. During super dehumidification the unit will produce net heat, the outgoing air from the unit will be about 2-4C higher than the incoming air. This also ensures that the heating elements will be activated even less. Unless the minimum night temperature is achieved, for example because the outside temperature is very low, the heating will be activated. However, there are electric heating elements in the PRO4. These will be activated during the night when no dehumidification is needed and if the night temperature drops below the set value. The PRO4 is efficient with water and electricity and has a much higher dehumidification capacity. However, the efficiency does not change the maximum water consumption per minute nor the maximum power consumption. However, the water and power consumption will decline because both sources are needed less frequently, and thus every day there will be less water and power consumed. The fuses and pipe diameters must be equal to PRO2 or PRO3.